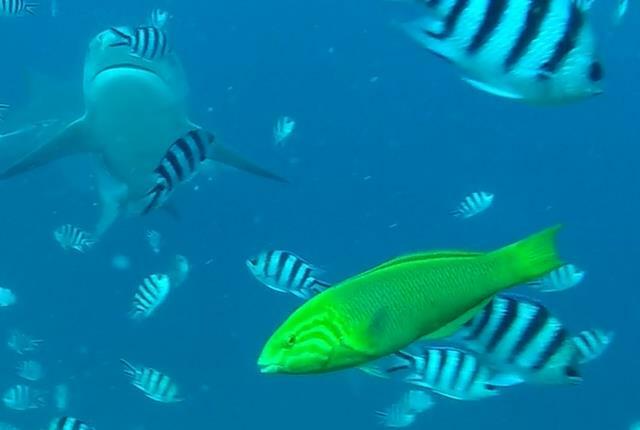 Although many divers visiting Fiji would probably be most interested in the shark dives, the more conventional dives are nothing to sniff at either. 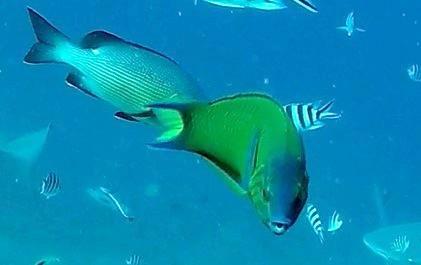 Diving in Nadi and elsewhere in Fiji has its own non-shark-related charms. 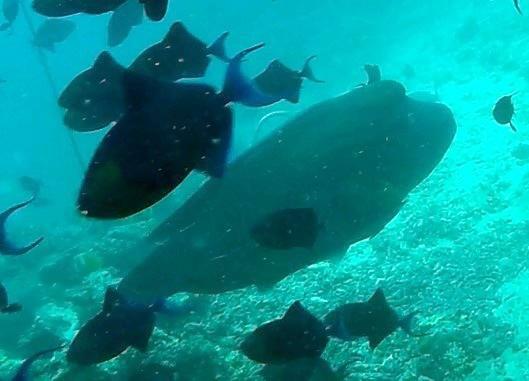 We saw this endangered humphead wrasse (aka Napoleon wrasse) during the dive with Beqa Lagoon Resort. One of the highlights of an otherwise disappointing dive! Male humphead wrasses can grow up to 2m long(!) but are typically less than 1m. The females are slightly smaller. I don’t know how big this one was – all I know is that it was massive. Pictures don’t do it justice! 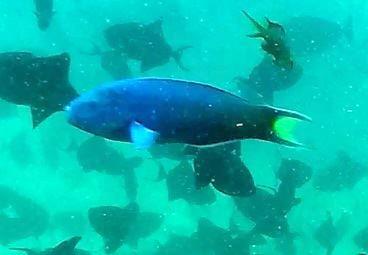 We also saw a tremendous number of red toothed triggerfish on that dive, as you can see in the picture. I know they’re not titan triggerfish (and hence far less likely to bite), but I’m still wary of them. 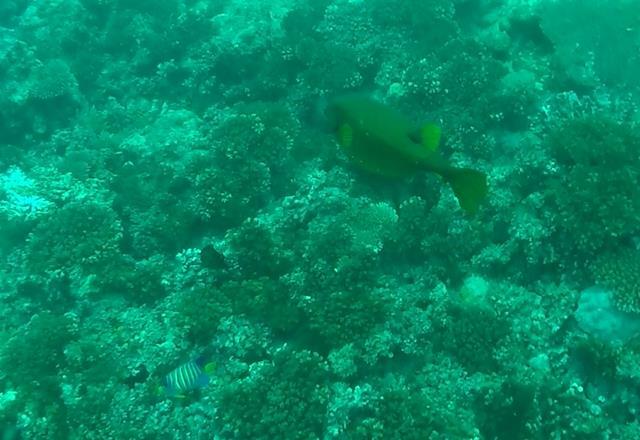 I also saw plenty of my favourite fish – the moon wrasse. Always delighted to see them! Which is great, because they’re very common. I am easily satisfied! But on this trip, I also encountered their cousin – the sunset wrasse. They add a huge dose of vibrant colour to the scene. 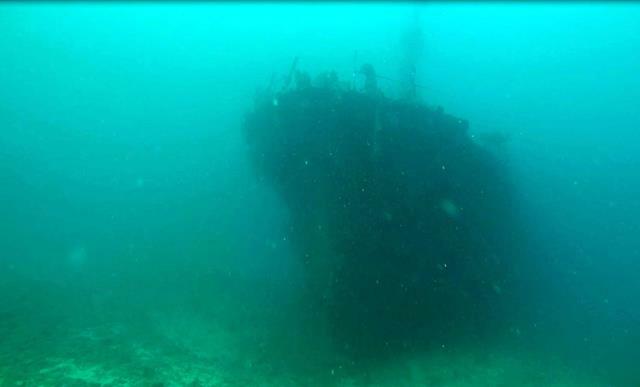 And if you get tired of corals, how would you fancy a shipwreck? It makes for amazing pictures, but I do wish they provided proper fins instead of swimming flippers – I’m not used to having to work so hard while diving! 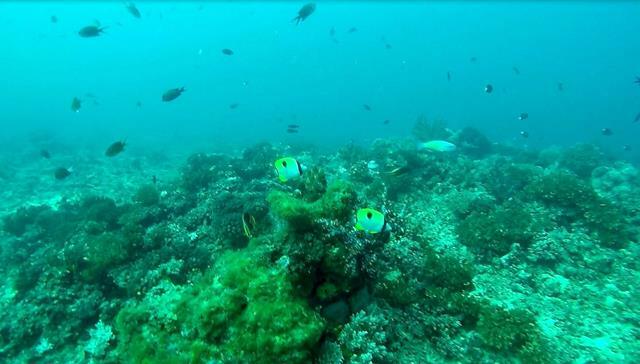 If you want to go diving in Nadi, I recommend Scuba Bula. 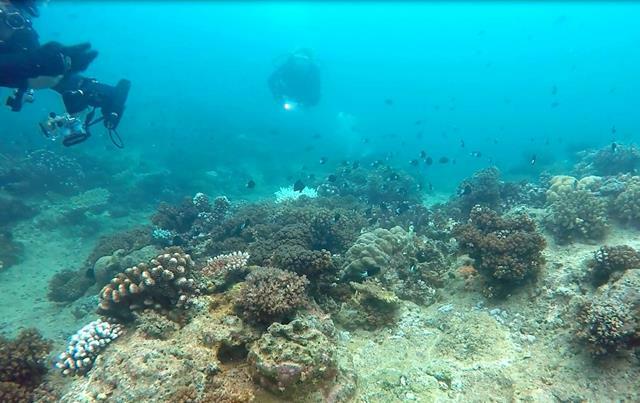 This was a regular coral dive, and we had to wade out pretty far to the boat (not with the air tanks, thankfully!) 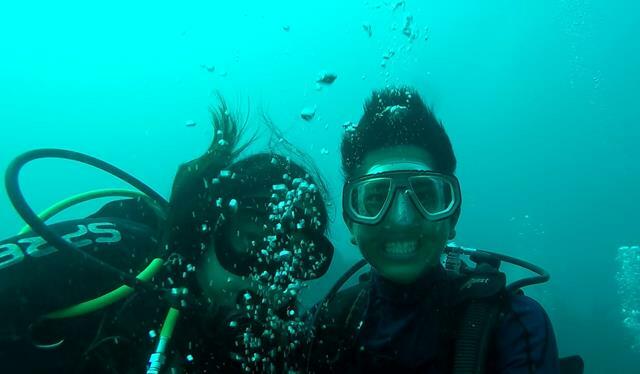 but I really enjoyed this dive because we had the most entertaining divemaster, Api. The staff in general were very professional and helpful. I was also impressed with the equipment – super new and high-end regulators with attached dive computers(!). The BCDs were new too! In the winter months (May to September / October), you can see pelagics here – humpback whales, dolphins and mantas. The location is a bit unusual – it’s located in a resort which is closed for renovations and there was no running water, but I expect everything to return to normal once the resort reopens. There’s also a Marriott opening nearby in 2017, so it will be super convenient to dive at Scuba Bula if you stay there! 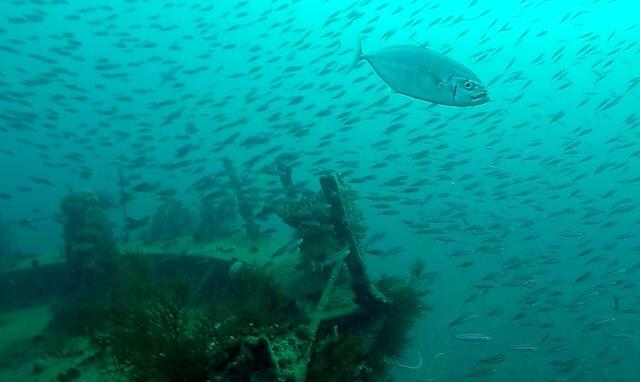 Price: FJD240 (USD116) for 2 dives. If you aren’t keen on shark dives, I encourage you to consider doing other dives in Fiji nonetheless. You get to meet really cool people (although this goes for diving in any part of the world, I guess!). We met a couple from Colorado, a Danish girl with Sri Lankan roots, a producer for a US TV show, a pair of digital nomads and even some fellow Singaporeans. They provide biscuits and tea during the surface interval. 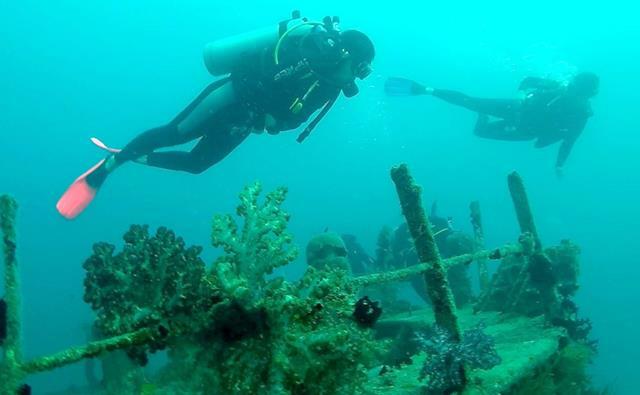 Boat dives (so much easier than shore dives – minimal walking around with your tank strapped on)! The water (at about 26 degrees C) is colder than I’m used to. Most people were wearing a 3mm wetsuit, but I felt cold in a 5mm one. I seriously considered buying a hood, but felt silly – who dives with a hood in 26 degrees?! I really grew to appreciate having a wetsuit with a good seal. You get even colder on a shark dive than a regular dive, because you’re not moving around. You’re stationary most of the time. I actually got a bit sick of diving halfway through the trip. It was after the unsuccessful trip to Beqa Lagoon to see a tiger shark, and I’d simply had enough of getting up early, struggling to get into my wetsuit, feeling cold and battling seasickness on a daily basis. The upshot: we took a day off diving and explored Nadi, which was a nice change of pace and scenery. Have you ever had enough of one of your favourite activities? How did you deal with it? The main reason I love scuba diving is for the adventure, you don’t know what it may happen or what you may find below the water surface. In the past years I’ve taken a lot of pictures which I store in the https://dive.site logbook, along with all my diving logs.